I recently built my first site with Drupal 8, off of the public beta. One thing I found very quickly was that online learning resources for Drupal 8—as compared to Drupal 7—were essentially non-existent. Most of the tools that I normally reach for—drupal.org issue queues, stack exchange, tech blog tutorials, and youtube tutorials—simply haven't built up a good stock of Drupal 8 answers yet. To make matters worse, what little knowledge I could find was often hopelessly out of date by the time I encountered it. This is, of course, nobody's fault. D8 is moving quickly, and needs to keep moving quickly in order to get a release out in a timely manner. It's impossible to document such a moving target, and the people most able to write such documentation are hard at work building the actual Drupal core. Without the ability to Google my Drupal 8 questions, I had to figure out things by intuition, and by analogy with other components. I figured out the theme structure by inspecting the source of Bartik, and I figured out how to create new modules largely from looking at the core Comment module. Slowly, through trial and lots and lots and lots of error, I found answers to all of my questions. Those answers follow. Where do I download a base theme for Drupal 8? How do I create a new theme in Drupal 8? 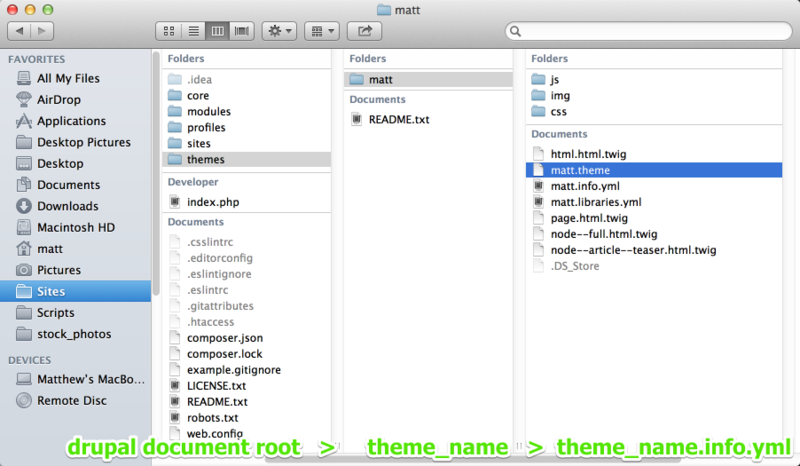 How do I declare a new template file in my Drupal 8 theme? How do I find out what template files I can use? How do I turn on twig debug mode? Why do I have to clear cache after every change anything in my template file? I did set twig auto_reload to true, why do I still have to clear cache all the time to see my Twig changes? How do I preprocess my template files? Why am I unable to save services.yml? 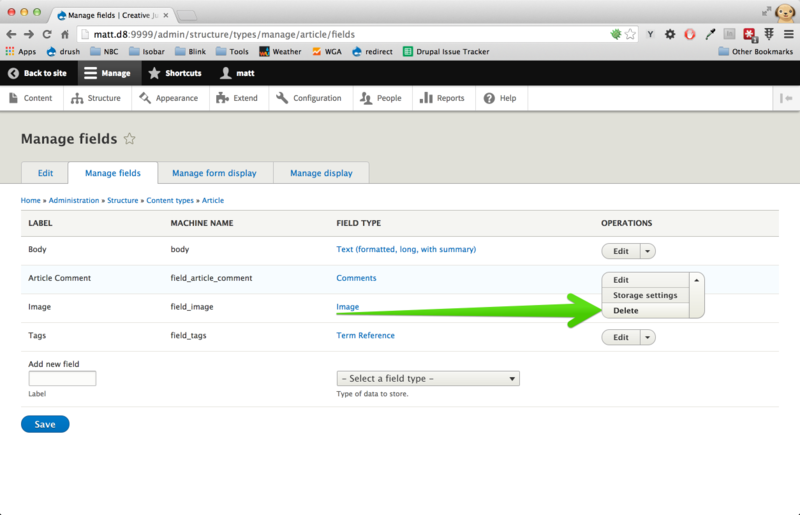 How do I enable jQuery in Drupal 8? 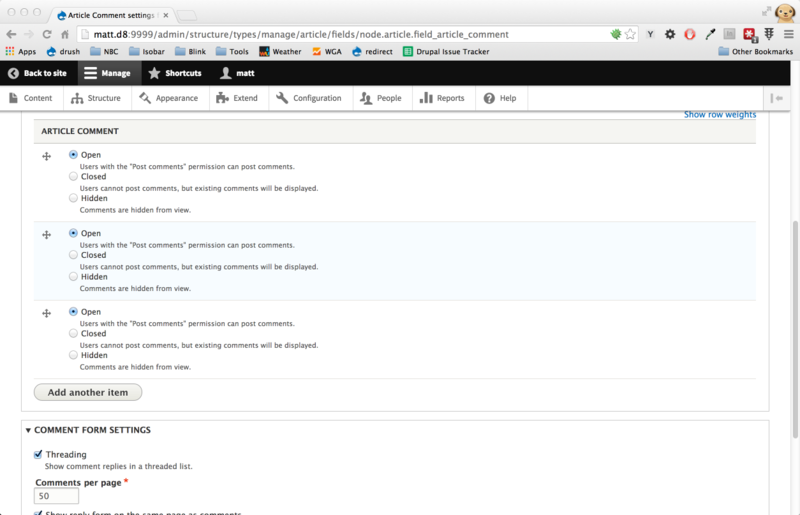 How do I disable commenting on articles? How do I change the submitted by information? Why can't I disable modules in Drupal 8? How do I create a custom module in Drupal 8? What the hell happened to all the fonts on the node add page? How do I version my configuration with git? How do I deploy this thing? How do I upgrade to php 5.4? Why am I getting a white screen of death in production? Why is `drush cc all` not working? Why isn't drush working at all with Drupal 8? How do I upgrade to Drush 7? 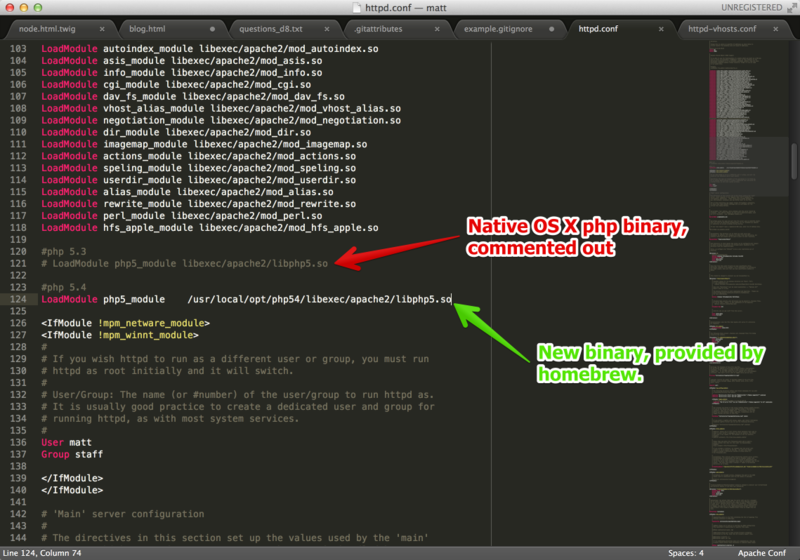 OK so I upgraded to php 5.4, installed composer, installed drush 7, and then ran `drush cr` in production now what? How do I integrate with Varnish? As of this writing, you don't. It's true that there are a few themes that have tried to keep pace with Drupal 8 in the pre-beta phase. These are admirable efforts, but none have kept up with the rapid pace of D8 developement. I tried my normal go-to, Adaptive Theme, but the D8 version was unusable, and threw tons of fatal errors as soon as I installed it. I took a look at Zen, but the D8 version hadn't been updated in a year, and its own release notes called it "completely broken." Bootstrap offered a similar caution on their project page. I'm sure circumstances will improve, but as of today, if you want to theme your D8 site, you're going to have to work from scratch. But I promise it's really not so scary. 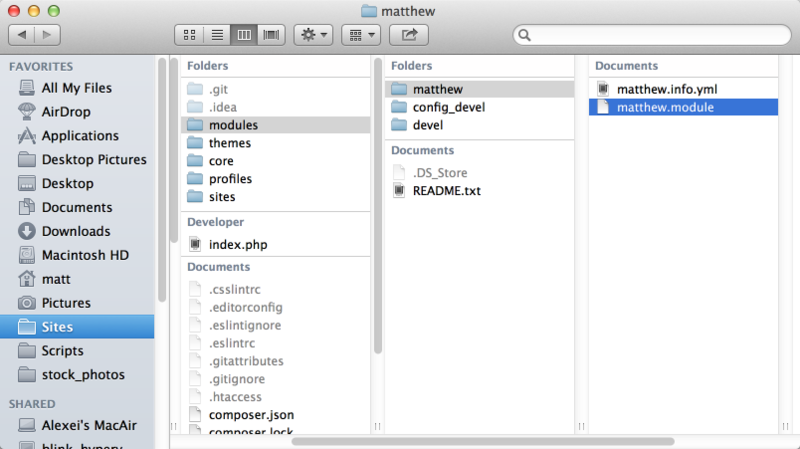 Here's the folder structure of my custom theme. A side note here that I won't dwell on: you'll probably find YML pretty hard to read for the first little while. I still haven't gotten all the way used to it, but it's gotten a lot better in just a few weeks. 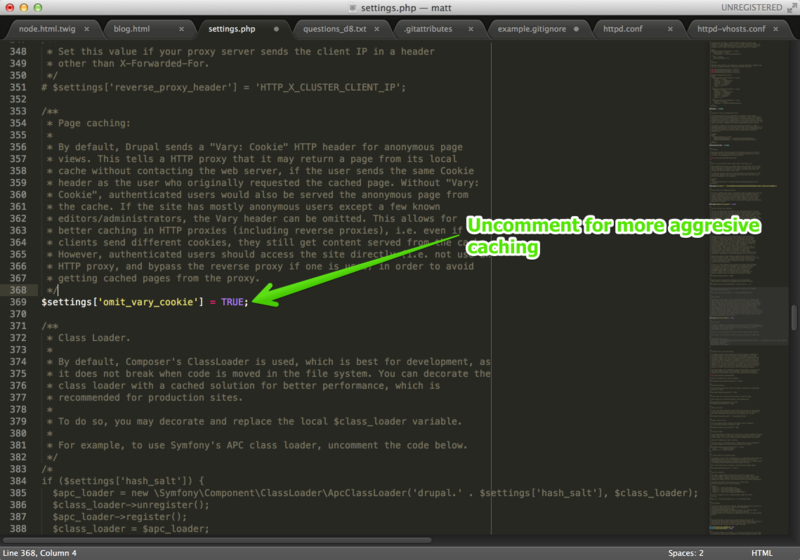 I also find that liberal use of code folding in Sublime Text makes YML a lot easier to digest. The other files that you'll almost definitely want are theme_name.theme, a php file, equivalent to the template.php and used mostly for preprocessor functions, and page.html.twig, equivalent to page.tpl.php in D7. 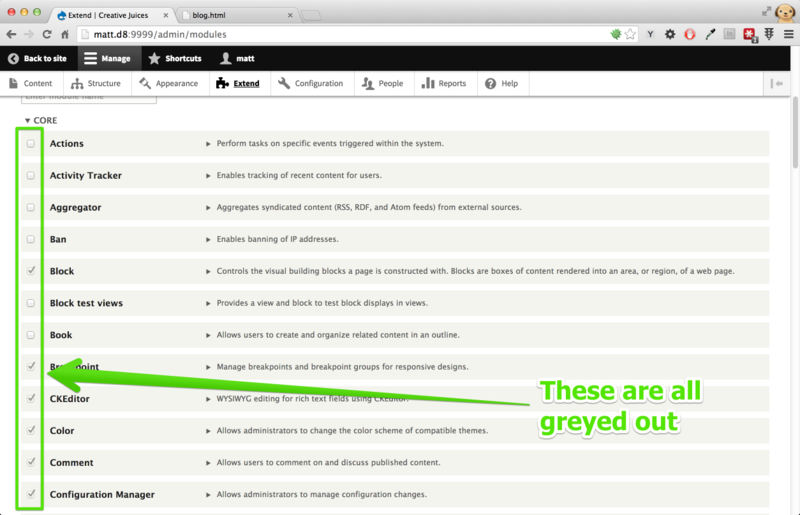 No real changes here from Drupal 7, other than the fact that php templating is gone, and replaced with Twig templating. Just like Drupal 7, you can instantiate new template files in the root of your custom theme folder simply by giving them the same name as one of the template files in core. 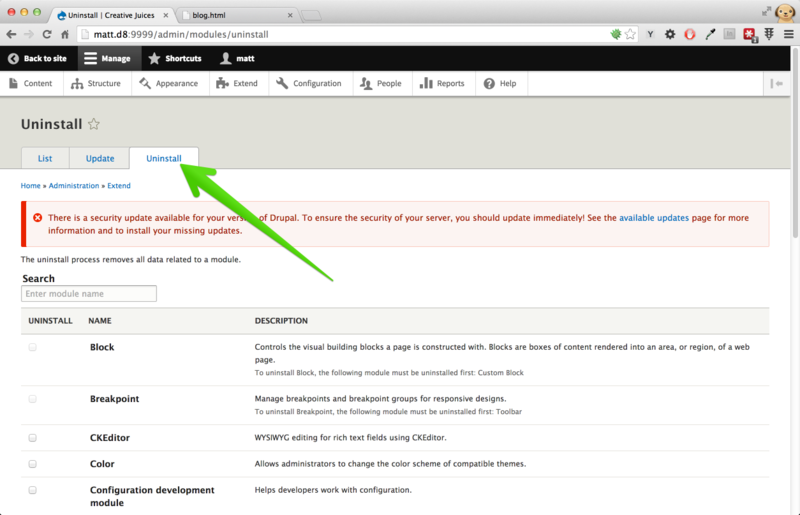 Like Drupal 7, you can limit the scope of your template file by giving it a specific name, according to that element's "theme suggestions." 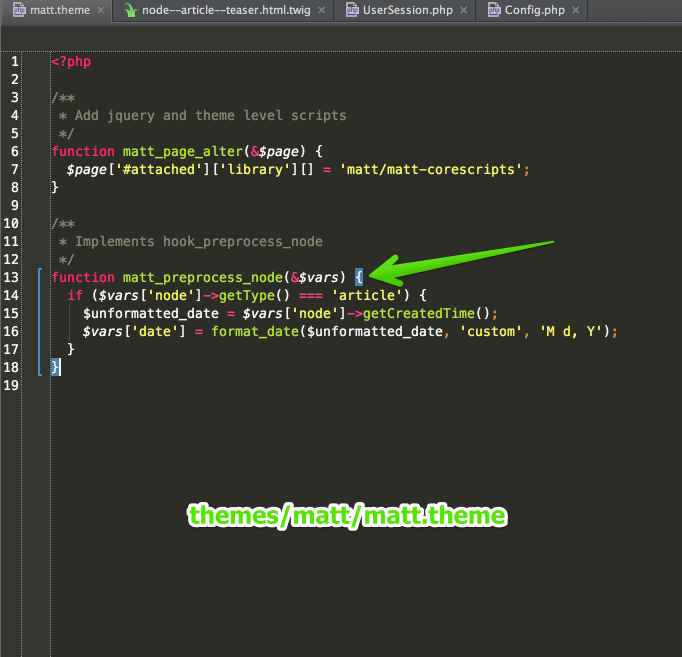 (The new documentation is no longer calling these "theme hook suggestions.") So for instance, you can create a node.html.twig which will apply to all nodes, and then a node--article.html.twig which will apply only to nodes or the type article. Note that the available theme suggestions is vastly imporoved in D8, giving you out-of-the-box ability to target by content type, view mode, and a wide variety of other conditions. 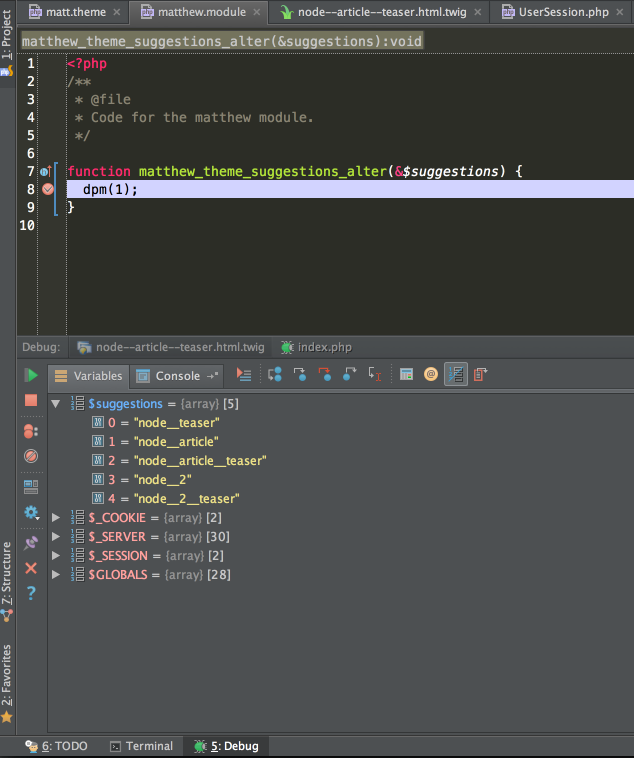 Improved theme suggestions is one of my favorite new features in D8. You can also accomplish a pretty much identical thing by implementing a new API hook added for D8, hook_theme_suggestions_alter. You have to set auto_reload to true in services.yml (see #6 above, note lines 30 and 41 of the code sample). It's about the same as D7 actually. Note that, like D7, only the base hook can be used for preprocessing templates. So if you declare node--article--teaser.html.twig you cannot declare hook_preprocess_node__article__teaser, but instead must use hook_preprocess_node and then add conditional logic inside to limit the scope of your preprocessing. That's a great question, I have no idea. 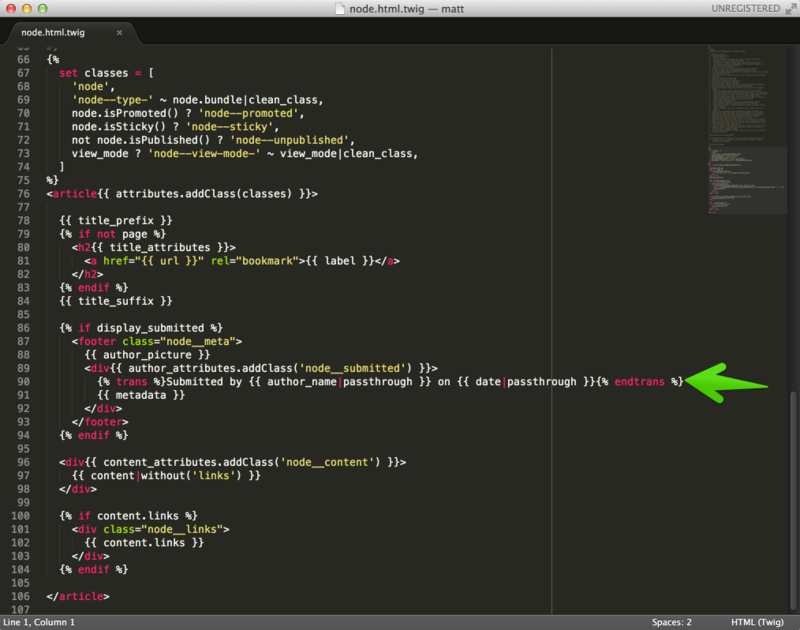 I was unable to save this file regardless of file permissions or ownership, using Sublime Text or PHP Storm. jQuery is still shipping with D8 (version 2.1.0 by the way! ), but it is not injected into the page by default. Save your custom script in themes/theme_name/js/script_name.js. Technically this can be any path. I'm pretty sure there's a more native way to do this, but the only solution I could find was to do it in html.html.twig. Note line 7. Comments on nodes are now fields, and thus controlled with field settings. Just copy this file into your custom theme and edit as needed. 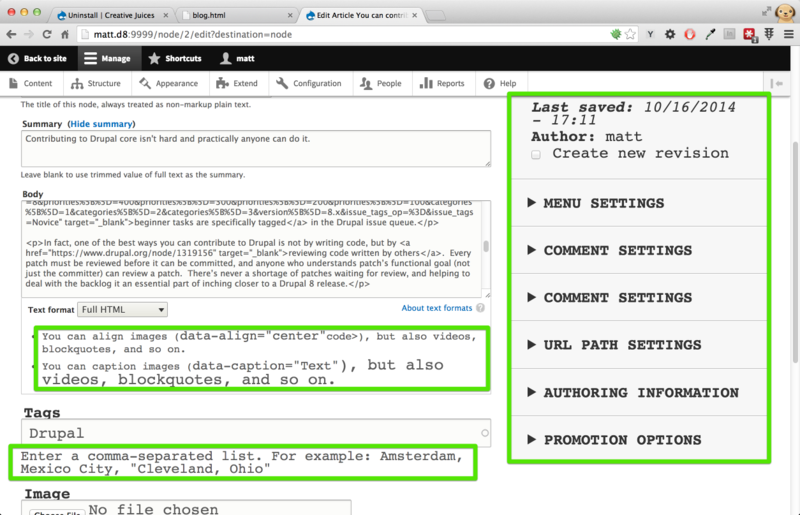 Creating a bare-bones, "hello world" type module is about the same in Drupal 8 as it was in 7. You only need two files your_module.info.yml and your_module.module. I'm told that the .module is actually optional now, but I've yet to figure out how to produce a functioning module without it, so I'm not sure if that's true. I never solved this, but I also never reproduced it. Once I reproduce it, I'll open an issue thread on drupal.org, but for now I don't really have anything to report. You've probably heard a lot about the configuration managent initiative over then last few years. You probably also heard recently that active configuration is now stored in the database by default. In the end, this turns out to be a pretty trivial change to the overall architectue of CMI as far as most users are concerned, because the only CMI files that you meaningfully interact with are still stored in code. One last thought, that confused the hell out of me initially: the "config" directory comes with two subfolders, "active" and "staging". In the default configuration, only "staging" will ever be used, and "active" will remain empty forever. Of course this language "default configuration" implies that there's some other not default strategy in which the "active" directory would be used. I haven't figured out how to do that yet, but I'm reasonably sure it would be done in services.yml. 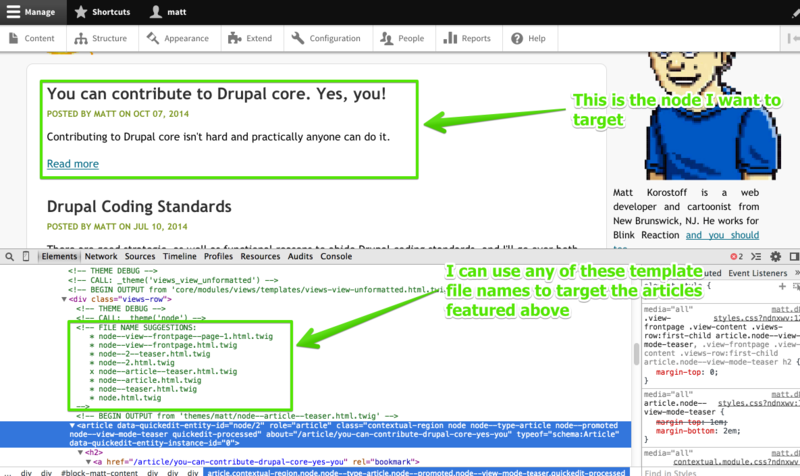 Note also that .gitignore is still shipping with Drupal core, but it's now called example.gitignore. The idea is that you copy example.gitignore to your git root, which would be above the drupal root, and then rename it ".gitignore" so that you're not modding core. For my first build, I just made my git root and my Drupal root the same directory, and renamed this file in place. Exported my database from my local with Sequel Pro. Imported my database to production with Sequel Pro. SFTPed my code to production with Cyberduck. SSHed to production and edited my database credentials with Nano. 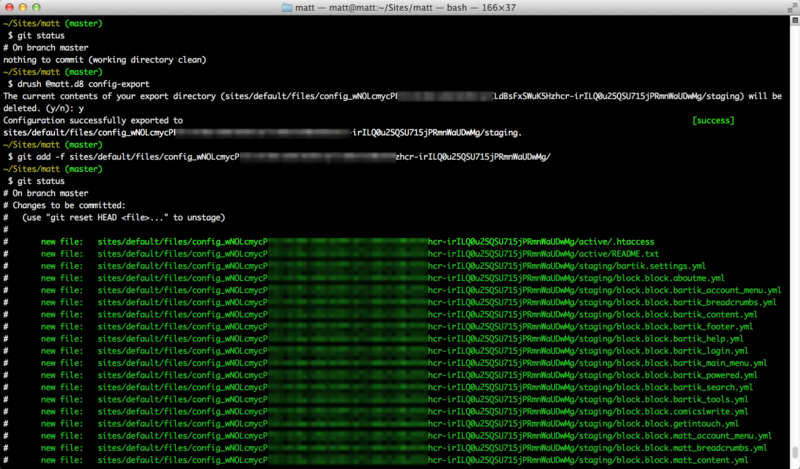 While SSH'ed to production, edited services.yml to match its default, production ready state. Navigated to my new site in Chrome. It works! One important note, if you're server is currently running php 5.3 or less, you're going to have to upgrade to 5.4 or greater. Of course, the upgrade procedure is going to vary wildly with OS, but for me, I was running OS x locally, and Ubuntu on the server. I found this answer here. Tons of possible reasons, but for me all I needed to do after importing my database was clear the cache with drush one time. I couldn't access any page (including the performance settings page with the "clear cache" button) until this was done. It's `drush cr` now. Stands for 'cache rebuild.' Also, you're gonna need to upgrade to Drush 7, more on that below. You need to upgrade to Drush 7. 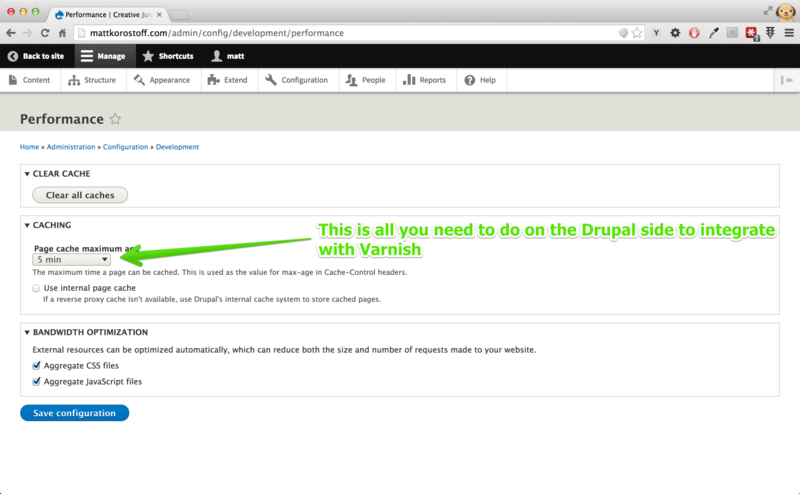 Much like Drupal 7, Varnish configuration is more or less out-of-the-box. Note that this page is trying to guide you toward using Varnish without really saying it. If you don't plan on running varnish, you'll probably want to check off "Use internal page cache". 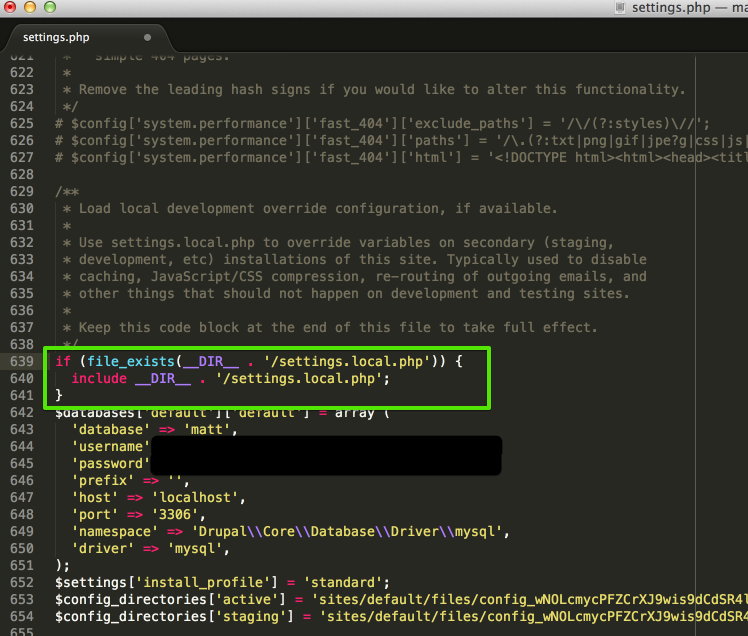 One thing I always do when working on a site for which I'm the only logged-in user is omit the "vary cookie" in settings.php. This bumps your varnish hit rate to just about 100%. In D7 it also broke user login. In D8, as far as I can tell, user login works even without the vary cookie, so there might be no downside here.